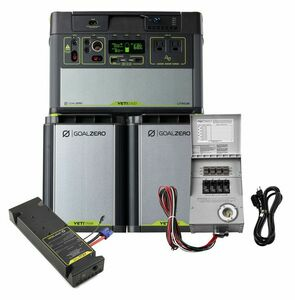 The Goal Zero 3.8 kWh Home Energy Storage Kit gives you the power you need to run essential circuits in your home for 2 - 3 days. Kit includes a Yeti 1400 Portable Power Station, Home Integration Kit, Yeti Link Expansion Module, and 2 Yeti Tank Expansion Batteries. • Lightweight lithium batteries yield long runtimes and extended 18-month shelf-life. High quality cells feature additional monitoring electronics for superior management and ultimate safety. The lithium pack is also easily replaceable. • Featuring a User Friendly LCD Screen. Get real-time usage data at a quick glance. The upgraded display features a runtime/recharge time estimator, as well as an output and input meter. 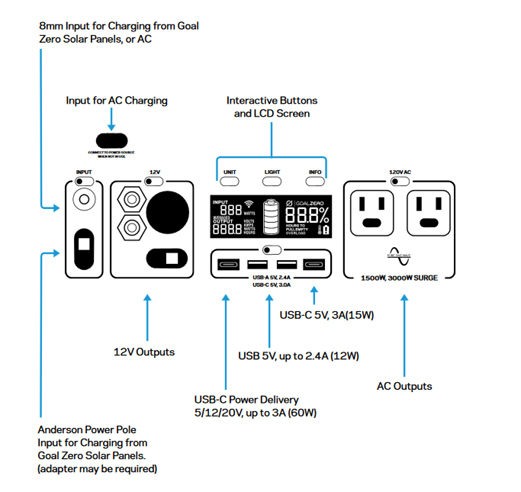 • The Goal Zero Yeti Home Integration Kit is an easy-to-install way to use your Yeti Portable Power Station to keep essential circuits in your home running, even when the power isn't. • Customize your backup power by working with a licensed electrician and selecting up to 4 circuits from your breaker panel. Suggested circuits include fridge/freezer, garage door, outlets in main living areas, light switches, etc. Cold temperatures (below freezing) can impact the Yeti's battery capacity. If you'll be living off-grid in sub-zero conditions, we recommend keeping your Yeti 1400 Lithium in an insulated cooler, connected to a power source (solar panels), and charging your gear. The natural heat generated by the Yeti 1400 Lithium contained in an insulated cooler will keep battery capacity at its highest. When charging gear with the Yeti 1400 Lithium, take note of the LCD Battery Display. If you plug in devices that have a high power requirement (a large refrigerator), the charge level of the Yeti can drop very quickly and you may not get exactly 1400Wh of energy. Also, especially when using the AC power output, the Goal Zero Yeti will be converting the energy from the DC power of the battery to the AC power needed by your device. Although your Goal Zero Yeti has a highly efficient inverter, there is still some energy lost in the conversion and you will not get the full rated capacity of the battery. The Goal Zero Yeti 1400 Lithium can be charged by connecting a compatible solar panel. If you are a standard or light user and use about 30-40% of the power per day we recommend 1 Boulder 100 Solar Panel. If you are a heavy user using all the power in one day, we recommend using 4 Boulder 100 Solar Panels to recharge. Keep your Yeti Lithium 1000 or 1400 safe during transportation and out of the elements with a sturdy case. Features shoulder strap for carrying and buckles for securing. Does not provide a waterproof enclosure for the Yeti.